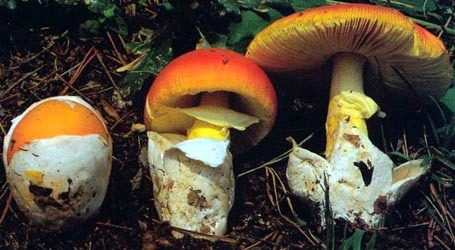 english name "Yellow Headband Ringless Amanita"
intro The following based on original research of RET. cap The cap is 32-80 mm wide and has a deep olive center transitioning to yellowish olive and then white at the edge. The cap is bell-shaped to convex and remains unchanged when bruised or cut. The flesh of the cap is white to pale gray. The volval remnants are crumb-like warts which separate easily from the cap and are white at first then become pale gray to black at their highest points. gills The pale off-white gills are narrowly attached and close together. The plentiful short gills are squarely cut off, of diverse lengths, and are unevenly distributed. stem The mostly hollow stem is 84 - 135 × 5.5 - 12 mm and is white to pale cream with a yellowish tinge, becoming grayish at maturity or with handling. 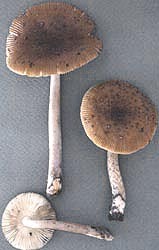 The stem is sometimes decorated with pale gray to brown fibrils in a chevron pattern. The stem narrows upward and flares at the top. The stem’s flesh is white and remains unchanged when cut or bruised. The volva barely covers the stem’s base and is whitish to pale cream. Volval remnants may be present as fragile cracking patches that are gray to dark gray and easily flake off. odor/taste Amanita xanthomitra is odorless. Its taste has not been recorded. spores The spores measure (7.7-) 8.4 - 12.6 (-13.6) × (7.3-) 8.0 - 12.2 (-13.3) µm and are inamyloid, globose to subglobose. Clamps are probably lacking at bases of basidia. MK277566 nrLSU 2.viii.2008 NEMF 2008 participant s.n. (RET 446-9) L. Nagy, Agaricales Diversification, Szeged Univ. The following material is based on molecular work by Dr. L. V. Kudzma and other original research by R. E. Tulloss. pileus 32 - 80 mm wide, more yellow than 5D5 or more olive than 5C5 and 10YR 6/4 or browner than 2.5YR 6/4 or more saturated than 2.5YR 7/4, often darkest over disc, with young specimens having a deep olive disc which transitions to yellowish olive then yellow and finally white at the margin, occasionally with white or very pale margin persisting at maturity, sometimes with thin dark line developing along margin, campanulate at first, unchanging when bruised or cut, becoming convex to planoconvex and somewhat depressed, sometimes finally concave, dull, fiscid at first then faintly tacky to somewhat waxy; context white with pale sordid tint at times, faintly to intensely concolorous with pileipellis for 1± mm below same, unchanging when cut or bruised, 2 - 4.5 mm thick at stipe, thinning evenly for one half to three-quarters of radius, then membranous to margin; margin striate (0.3 - 0.5R), nonappendiculate, sometimes developing fine dark radial lines on outer parts of ridges between striations; universal veil as crumb-like or pyramidal warts (in latter form often plentiful and then densely concentrated over disc) or as confluent patches of varying sizes, white at first, soon becoming pale brownish to pale gray then gray and eventually black (at least on highest points), finely verruculose, detersile. lamellae narrowly adnate without decurrent line on stipe apex or with a tiny decurrent tooth (lens), close, off-white to very pale cream in mass, white to very pale off-white to barely creamy white to slightly watersoaked white in side view, unchanging when cut or bruised, 3 - 8.5 mm broad, at first with white minutely flocculose edge, occasionally anastomosing; lamellulae truncate to subtruncate, unevenly distributed (in some material absent between all lamellae for ca. 20% or more of cap circumference), of diverse lengths, plentiful. stipe 84 - 135 × 5.5 - 12 mm, white to pale cream with yellowish ting, becoming grayish at maturity or handling in some specimens, rather strongly fibrillose in chevron-like pattern, with fibrils white at first, becoming pale grayish to dark gray to gray brown to black at maturity or with handling, narrowing upward, flaring slightly at apex; context white, unchanging when cut or bruised, concolorous in larva tunnels, hollow with some cottony white fibrils, with central cylinder 3 - 7 mm wide; exannulate; universal veil often as thin appressed cup whitish to pale cream barely covering stipe base, additionally (remains of limbus internus) as appressed wavy line or lines (12 - 20 mm up from base of stipe) pallid to pale brownish at first becoming black with age (persistent in exsiccata in this form) and having subtriangular cross-section, additionally sometimes a few small scattered cracking detersile patches (sometimes confluent), very fragile (submembranous, friable), pallid at first, becoming dark gray to black. tests Syringaldazine, spot test for laccase - negative throughout. Paracresol, spot test for tyrosinase - rapidly positive throughout basidiome except negative in base of stipe. Test voucher: Tulloss 8-9-87-A. [140/7/4] (7.7-) 8.7 - 11.9 (-13.6) × (7.3-) 8.4 - 11.5 (-13.3) µm, (L = 9.5 - 11.0 µm; L’ = 10.1 µm; W = 9.1 - 10.6 µm; W’ = 9.6 µm; Q = 1.0 - 1.09 (-1.19); Q = 1.03 - 1.08; Q’ = 1.05), hyaline, colorless, smooth, thin-walled, inamyloid, globose to subglobose, infrequently broadly ellipsoid, at least somewhat (and often distinctly) adaxially flattened, occasionally with some "giant" spores present; contents mono- to multiguttulate (with or without additional small granules) to granular; apiculus sublateral, cylindric, often prominent; white in deposit. ecology Solitary to subgregarious. New Jersey: In sand of oak-pine (Quercus-Pinus rigida) barrens. Pennsylvania: At ca. 420 m elev. In loam of mixed forest with Quercus, Tsuga canadensis, Pinus, etc. material examined U.S.A.: CONNECTICUT—New London County - Griswold, Hopeville Lake St. Pk. [41.608° N/ 71.9232° W, 67 m], 31.vii.2015 Judith E. s.n. [Tulloss 7-31-15-H] (RET 704-5, nrITS & nrLSU seq'd.). FLORIDA—Hendry Co. - Okaloacoochee Slough St. For. [26.56625° N/ 81.31205° W, 9 m], 20.ix.2014 Ben Dion s.n. [mushroomobserver #179787] (RET 652-7, nrITS & nrLSU seq'd.). MAINE—Sagadahoc Co. - Georgetown, Reid St. Pk., 8.viii.2014 Elaine Quaroni s.n. [Tulloss 8-8-14-L] (RET 626-5, nrITS seq'd.). York Co. - unkn. loc., 28.vii.2014 Herber Baker s.n. [mushroomobserver #171750] (RET 645-4, nrITS & nrLSU seq'd. ), [mushroomobserver #171596] (RET 645-9, nrITS seq'd.). MASSACHUSETTS—Middlesex Co. - ca. Sudbury, Hop Brook Marsh Cons. Area, 14.viii.1993 Jean Deprés s.n. [Tulloss 8-14-93-A] (NY; RET 095-1, nrITS seq'd. ), R. Buttignol s.n. [Tulloss 8-14-93-B] (RET 094-10, nrITS seq'd.). NEW JERSEY—Burlington Co. - Audubon Rancocas Nature Ctr., 28.viii.2009 Rena Wertzer s.n. [Tulloss 8-28-09-B] (RET 437-2, nrITS seq'd.). Mercer Co. - Hopewell Twp., Bell Laboratories (Lucent) [40°21’39” N/ 74°43’29” W], 18.vii.1984 R. E. Tulloss 7-18-84-D (RET 242-2); Hopewell Twp., Stony Brook-Millstone Watershed Res., 18.ix.1994 R. E. Tulloss 9-18-94-A (RET 130-3). Monmouth Co. - Shark River Co. Pk. [40°12’18” N/ 74°05’44” W, 16 m], 9.viii.1987 Ed Van Schoick s.n. [ Tulloss 8-9-87-A] (RET 180-7), 5.viii.2009 R. E. Tulloss & F. Wartchow [Tulloss] 8-5-09-A (RET 436-1, nrITS seq'd.). NEW YORK—Dutchess Co. - Clinton Corners, Walnut Lane, Boyer Farm, 12.ix.1990 William Bakaitis 90-189 (RET 011-3, nrITS seq'd.). NORTH CAROLINA—Haywood Co. - GSMNP, Cataloochee sector, vii.2008 Debbie Viess s.n. (RET 445-9, nrITS & nrLSU seq'd.). PENNSYLVANIA—Clarion Co. - Clarion, St. Game Lands 63, Roberts Hill Rd. [41.1421° N/ 79.2830° W, 419 m], 6.viii.2011 Angie Miller s.n. [Tulloss 8-6-11-B, NAMA 2011-245] (F; RET 478-7, nrITS seq'd.—different taxon?). Unkn. Co. - Caledonia St. Pk., ca. border of Franklin & Adams Cos., 12.viii.2005 L. H. P. Yarroll s.n. [Tulloss 8-12-05-C] (RET 386-4, nrITS seq'd. ); "Pocono region," 19.vii.2015 David Wasilewski s.n. [mushroomobserver #210820] (RET 706-4, nrITS seq'd.). The presence of "giant spores" in one of the three specimens of RET 280-7 will continue to distort the sporograph of this species until several more collections are made that do not add to the number of "giant spores" in the spore sample for A. xanthomitra. 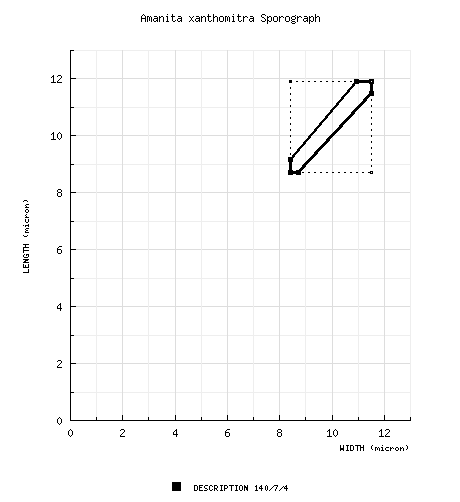 We estimate that the 95th percentile of spore length will stabilize ca. 11.0 μm. 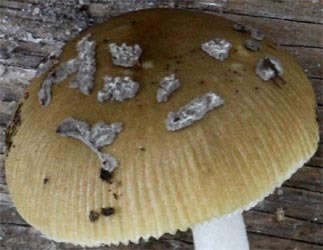 This taxon was previously called Amanita sp. 42 in Tulloss' keys, checklists, and correspondence and was previously designated A. sp-N59 on this site. photo RET - (1) 9.viii.1987, Shark River County Park, Monmouth County, New Jersey, U.S.A.
(2-4) 5.viii.2009, Shark River County Park, Monmouth County, New Jersey, U.S.A.